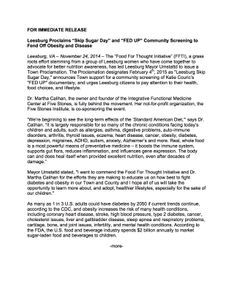 Leesburg, VA – November 24, 2014 – The “Food For Thought Initiative” (FFTI), a grass roots effort stemming from a group of Leesburg women who have come together to advocate for better nutrition awareness, has led Leesburg Mayor Umstattd to issue a Town Proclamation. 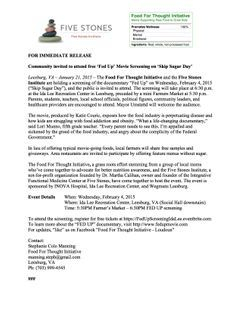 The Proclamation designates February 4th, 2015 as "Leesburg Skip Sugar Day," announces Town support for a community screening of Katie Couric’s "FED UP" documentary, and urges Leesburg citizens to pay attention to their health, food choices, and lifestyle. Dr. Martha Calihan, the owner and founder of the Integrative Functional Medicine Center at Five Stones, is fully behind the movement. Her not-for-profit organization, the Five Stones Institute, is co-sponsoring the event. Mayor Umstattd stated, "I want to commend the Food For Thought Initiative and Dr. Martha Calihan for the efforts they are making to educate us on how best to fight diabetes and obesity in our Town and County and I hope all of us will take the opportunity to learn more about, and adopt, healthier lifestyles, especially for the sake of our children." As many as 1 in 3 U.S. adults could have diabetes by 2050 if current trends continue, according to the CDC, and obesity increases the risk of many health conditions, including coronary heart disease, stroke, high blood pressure, type 2 diabetes, cancer, cholesterol issues, liver and gallbladder disease, sleep apnea and respiratory problems, cartilage, bone, and joint issues, infertility, and mental health conditions. According to the FDA, the U.S. food and beverage industry spends $2 billion annually to market sugar-laden food and beverages to children. FFTI is a fast-growing group who wants the community to encourage kids and adults to eat real, whole food as the normal way of life, just as it used to be, only a generation or so ago. FFTI wants to discourage the misdirected, ubiquitous message that eating sugary, chemical-laden foods and snacks is “OK” and “expected.” FFTI encourages, educates, and helps to foster healthier eating habits in our schools, community, and homes. FFTI also aims to embark on a local campaign to promote eating whole food as “hip,” and as the means to achieving beauty, brains, and fitness. “Real, whole food is fundamental to preventing and eliminating so many of today’s health issues. It’s really life-changing,” says Stephanie Colo Manning, FFTI Co-Director and Leesburg mom, who resolved her own autoimmune disease through diet, enabling her to eliminate prescription drugs. “Pulling the community together for a Leesburg “SKIP SUGAR DAY” and a public screening of the eye-opening “FED UP” documentary, is a huge step in promoting real food in our community,” says Carol Gordon, FFTI Co-Director, ACE Certified personal fitness trainer, and advocate for better nutrition awareness in our schools and homes. The community screening of “FED UP” will occur on Wednesday, February 4, 2015 at 6:30 p.m. at Ida Lee Recreation Center. For details and updates, visit the Facebook page, "Loudoun Food For Thought Initiative" and “LIKE” the page. The Food For Thought Initiative and Dr. Martha Calihan are honored to accept this Town of Leesburg Proclamation. Thank you Mayor Umstattd and Leesburg Town Council! Stephanie Colo Manning accepting the Town of Leesburg Proclamation, on behalf of the Food For Thought Initiative and Dr. Martha Calihan.